Normally I wouldn’t review a cookbook, but I’ve been eating out of this one for a couple of weeks now, and my husband has very politely requested that I stop raving about it to him. I’m hoping reviewing it for you will help with that. First, some background. I am not a cook by inclination. If I have a recipe in front of me, I can follow it with generally good results. But my day in no way revolves around the question “What fabulous thing can I whip up for [breakfast, lunch, dinner, snack]?” Most days I’m a grab and go sort of girl. In other words, I’m pretty much the target audience for this book. 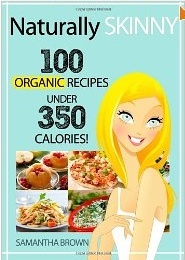 A complicated recipe in Naturally Skinny contains eight ingredients. Most contain three to five. The cooking techniques are super simple too. If you can heat a pan, turn on your oven, and use a toaster, you’ll be golden. On the flip side, if you, like my mother, can walk into a kitchen and concoct a fabulous healthy dinner from the somewhat random contents of any given fridge and pantry, this book is not for you. You will probably already know most of the recipes in it. That said, the recipes in this book are super simple and super delicious. They are the sort of food that is good for you, but doesn’t taste like it. They are also the sort of recipes that you only need to make once or twice to memorize, which means you’ll be well on your way to appearing to be the sort of cook who can walk into any given kitchen and concoct something lovely out of whatever happens to be in the fridge and pantry. It’s been some of the best eating of my life (outside of my mother’s home, that is). That sounds like an exaggeration, I’m sure, but then you don’t live with me. You don’t know what it is to eat my cooking every day. The only recipe I didn’t love at first bite was the strawberries and cream on toast, but then I have a love/hate relationship with cream cheese. I love cream cheese in cheesecake, hate it pretty much everywhere else. There are no pictures of the food in this book. This doesn’t bother me, because the recipes are so simple I don’t need a picture to tell me that I’ve gotten them right. But there it is. Brown tags every ingredient in her recipes with the word “organic.” This is potentially quite irritating, but I have it on good authority that the recipes don’t break if you use conventional ingredients instead (I reserve my organic dollars for the foods on the Environmental Working Group’s Dirty Dozen List). Overall, I’ve been very happy with this cookbook, and recommend it to anyone who wants to eat a variety of fresh, healthy foods without being cooped up in the kitchen for hours. And now it’s your turn. What are you cooking this week? Mom appreciates the praise. Does this mean I will be cooking when I visit, or will you be dazzling me? What? And miss out on a week of your cooking? I may be bested on a regular basis by my Five-Year-Old but really, I’m not a complete idiot. I can cook for myself at any time. Although I do want you to try this spinach and arugula salad. And maybe the chicken salad with apricots. And the banana bran muffins. And the ratatouille.